Olivia Yang, LCSW has over 10 years of therapy experience. She is a graduate of the University of Chicago, School of Social Service Administration. 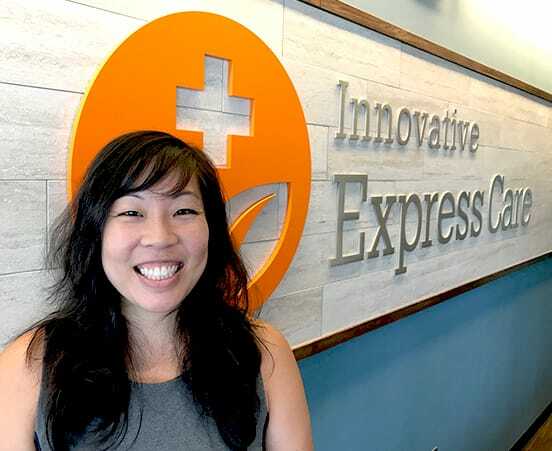 In particular, Olivia is helping Innovative Express Care address our patients with anxiety, PTSD, minor depression, and ADHD. She also specializes in trauma, mood disorders, family and relationship difficulties, and women’s issues. Olivia utilizes a flexible, eclectic and integrative approach that draws upon mindfulness, client-centered, relational / psychodynamic, cognitive behavioral (CBT), dialectical behavioral (DBT) and ego state therapies. She is also trained in Eye Movement Desensitization and Reprocessing (EMDR), a holistic, mind-body approach that is evidence-based and very effective for treating past trauma, as well as many other mental health disorders and concerns. Olivia tailors her evaluation and interventions to help each client authentically explore and express their innermost thoughts, feelings and desires, at their own pace, while offering gentle guidance, coaching, warmth, humor, empathy and compassion. Olivia strives to create a safe, non-judgmental therapeutic space that allows clients to identify and work toward their own personal goals, gain increased insight and self-awareness and develop coping skills and strategies to better tackle life’s problems, in order to achieve balance in all realms: mental, emotional, physical, spiritual, relational and professional. If you would like to begin therapy with Olivia Yang, LCSW, please call (773) 270-5600 and ask to book an appointment with Ms. Yang for therapy. We do accept insurance for therapy. If you would like to be evaluated for PTSD or ADHD, please click the link below. This evaluation costs $175. Later therapy (if needed or if desired) will be billed to your insurance.